Are You Serving Poolside? Five Ideas for Popular Vegas Pool Parties! – TAM Card® Nation in Vegas! Are You Serving Poolside? Five Ideas for Popular Vegas Pool Parties! Extended exposure to the heat and sun can cause dehydration. 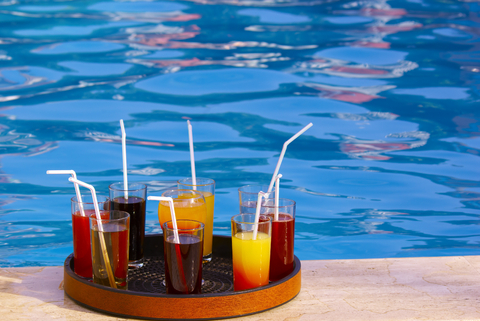 In fact, expert s will tell you to avoid drinks containing caffeine or alcohol while in the sun or heat. When a person is dehydrated, they actually have a lower volume of blood. With less blood in the system, it will take less alcohol to reach a higher blood alcohol content level. With each drink order, remember to ask, “Would you also like a glass of ice-cold water?” By helping your guests to stay hydrated, you’ll offset the dehydrating effects of the alcohol and the heat and sun. Offer food. Food in the stomach keeps alcohol in the stomach for a longer period of time which means that it will be absorbed into the bloodstream at a much slower rate. Count drinks and monitor behavior. By keeping track of how much your guests are drinking, you can better judge when they’ve had enough. When in doubt, do not serve. By following these steps, you up the FUN factor and you keep yourself, other guests and your establishment safe. What other ways that you have been managing service at Vegas pool parties? Previous Welcome to TAM® Nation in Vegas! Pingback: Summer Jobs – Opportunities Abound to Work Poolside in Las Vegas! | TAM® Nation in Vegas!